What is the Difference Between an RN and an LPN? Many people wonder what the difference between so many nursing titles mean. From CNAs to APRNs, the different types of nursing professionals are vast, and can be confusing to say the least! Below, we have taken some time to explain the difference between the two main types of nurses in the U.S.—LPNs and RNs. Keep reading to get a better understanding of what separates the two, and what these nursing professionals have in common. What Do LPN and RN Stand For? Both RNs and LPN/LVNs have essential roles to play in the nursing care of patients. Each of these types of nurses are needed for the nation’s healthcare system to work effectively and efficiently. What Are Some of the Differences in Roles Between RNs and LPNs? When a patient is admitted to a hospital or medical facility, or when they are seen at a clinic, a comprehensive patient care plan is developed and executed, under the direction of the physician, and in accordance with insurance and reimbursement requirements. An RN has the responsibility to see that the plan of care is adhered to by all members of the nursing staff. In the acute in-patient setting, an RN is also responsible for choosing, implementing and evaluating nursing care plans for each patient. An LPN is not legally able to develop or implement nursing care plans in hospitals. The LPN, is however, responsible for carrying out his or her unique role in the plan of care for the patient, and works under the direct supervision of an RN. The LPN’s role generally involves direct patient contact and basic care, such as checking blood pressure and vital signs, inserting catheters, changing wound dressings, collecting specimens of blood, urine, sputum, etc., seeing to the comfort of patients by helping them bathe or dress, and reporting status of patients to RNs and doctors. The Board of Nursing of each state sets its own scope of practice for the LPN, as well as for the RN. Specific roles may vary from state to state, so keep this in mind as you learn more about each type of nurse. RNs are licensed to perform all of the tasks outlined above for LPNs, and are additionally responsible for supervising plans for patient care, assisting physicians in surgeries, administering medication via the intravenous route, performing certain diagnostic tests and analyzing results, carrying out treatments for specific illnesses, monitoring recovery and progress, educating patients and families, and fulfilling many coordination and management roles. A larger proportion of LPNs work in long term care settings where they may find opportunities for supervisory positions over nursing assistants. The bulk of RNs work in hospitals; very few work in long term care. The main difference between the two is that the RN, with higher level training, has vastly more opportunities to specialize and to advance; the LPN has limited opportunities for specialization in hospitals or medical facilities but can assume wider responsibilities in nursing homes, rehabilitation centers, home care and other long term care settings. What are the Differences in LPN and RN Nursing Education? 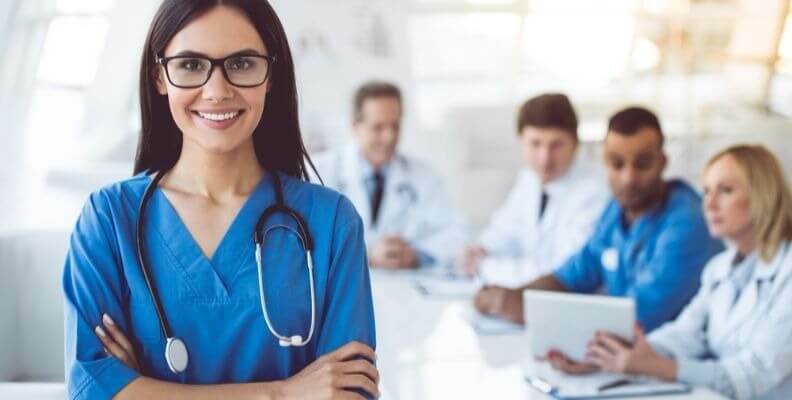 LPNs undergo one year training programs in technical or community colleges or in hospital based schools of nursing and receive a diploma or certificate. They take basic nursing courses such as Fundamentals in Nursing, Nutrition, Structure and Function of the Human Body, Obstetrics, Pediatrics and Pharmacology, and get assigned to clinical rotations at a variety of clinical settings. They then take the National Council Licensure Examination for Practical Nurses (NCLEX-PN) to obtain their LPN license. There are three common routes to the RN: A diploma program of two to three years at a hospital-based school of nursing, a two-year Associate Degree in Nursing (ADN) through a community or technical college, and a Bachelor’s degree (BSN) at a four year college or university. The RN program will include nursing theory and advanced knowledge courses. At the BSN level, leadership, communication and critical thinking courses prepare them for coordination and managerial responsibilities. Graduates of all three types of programs take the NCLEX-RN for licensure. Are There Differences in Salary for RNs and LPNs? According to the Bureau of Labor Statistics, there are some significant differences between pay rates for LPNs and RNs. All of the figures below are based on 2014 data, found at the BLS website in 2016. The 2014 average annual salary in the nation for LPNs was $43,320. The highest average was reported for home health services at $45,370. Hospitals paid an average of $42,330, while the average for physicians’ offices was $39,930. RNs earned an average yearly salary of $69,790 in 2014. Highest average yearly salary was reported for outpatient care centers at $72,390, followed by general medical and surgical hospitals at $71,640. RNs working in physicians’ offices earned an average yearly salary of $63,800. As you can see, there are a number of differences between LPN/LVNs and RNs within the healthcare system. From work setting, to education and earnings, LPNs and RNs experience differences, but ultimately work as part of the same team. Nurse leaders are found among both professions, and many LPNs possess clinical knowledge that some four year BSN graduates lack. Whether you choose to pursue your RN or your LPN, keep in mind that both routes are essential to the safety and care of patients across the country, and that as a nurse, you can positively affect lives in both career fields.